I love lemons so much that in my last two homes, we have planted a lemon tree. Well, we were very fortunate to have a “bumper crop” of lemons this year. This was quite the surprise, since I never covered the tree when freezing temperatures hit Las Vegas! I needed to use the lemons before they spoiled, so I decided to try the lemon poppy seed muffin recipe that I had “pinned” several months ago. I have to admit I was a little nervous about substituting buttermilk with Greek yogurt, but it came out so delicious and moist that I couldn’t have been happier. It was made with fresh lemon juice and zest, so the flavor was just perfect! The only other change I made was eliminating the ¼ teaspoon salt. I found this wonderful recipe on Food.com by Dine and Dish, September 30, 2004. I promise you that you won’t be disappointed! These lemony treats would be a hit at your next Sunday brunch! It is truly amazing that my tree has so many edible lemons and that I have so many buds that are starting to flower! I won’t be neglecting this tree anymore and it will be trimmed and fertilized organically soon! Preheat oven to 350° F. Line muffin tin with baking cups. Using a large bowl, cream the butter and sugar, until fluffy with a mixer. Add one egg yolk and beat well, then add second egg yolk and beat well again. Using a separate bowl, mix together the dry ingredients, poppy seeds and lemon zest. With the mixer set at low speed, combine the dry ingredients to the creamed mixture, alternating two times with the yogurt, then lemon juice and finally, add the vanilla. Beat until just smooth. In a separate bowl, beat the egg whites until you get soft peaks. Then gently fold into the muffin batter, until combined. Spoon batter into the muffin cup, ¾ full. Bake for 25 minutes, until golden brown and inserted toothpick comes out clean in the center. Cool in muffin pan for 5 minutes. Makes 12 muffins. 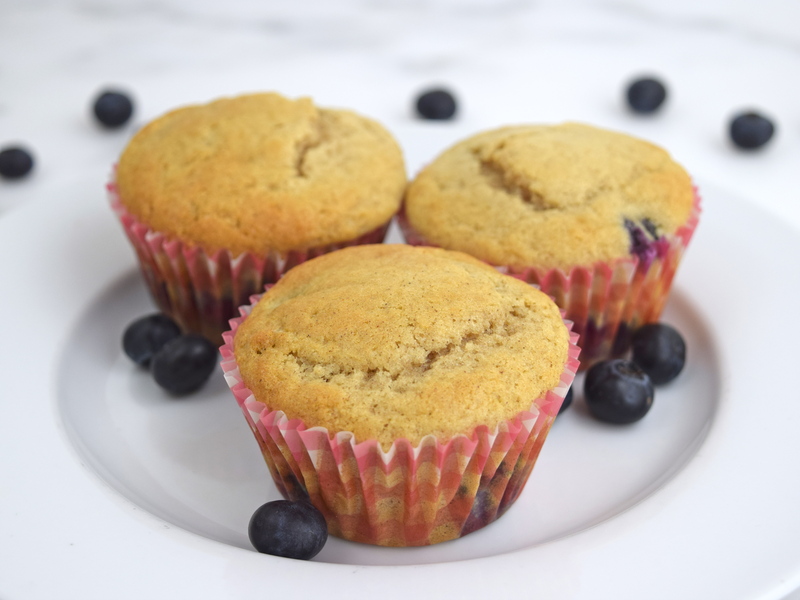 This morning, I was craving some blueberry muffins. 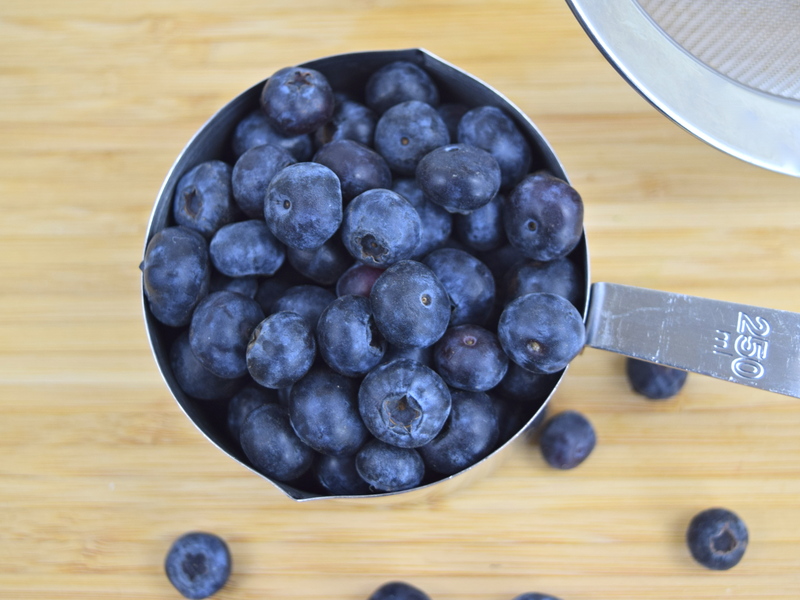 Luckily, I did have some fresh organic blueberries in my refrigerator. So I went to my bookshelf and found this recipe in the Williams-Sonoma Kitchen Library cookbook, Muffins & Quick Breads, Weldon Owen Inc., 1993. What I especially liked about this recipe was that I could use milk, instead of buttermilk or yogurt. All my ingredients used today were organic, except for the baking powder and baking soda. My muffins were very moist and not too sweet with just a hint of cinnamon. Needless to say, I had a wonderful treat with my morning coffee! Line standard muffin tins with 16 baking cups. In a medium bowl, blend together the flour, sugar, baking powder, baking soda, salt and cinnamon. Using another medium bowl, whisk together the milk, butter and eggs until smooth. Add the dry ingredients and mix until just blended. Finally, stir in the blueberries. Spoon batter into the muffin tins, ¾ full. Bake for 15 to 20 minutes, until a toothpick inserted in the center comes out clean. Cool in tins for 5 minutes and remove onto a cooling rack. Make 16 muffins. Happy New Year everyone! I hope your holidays were happy and healthy! Well, for me, the New Year means making some new resolutions and trying to live up to some old ones! 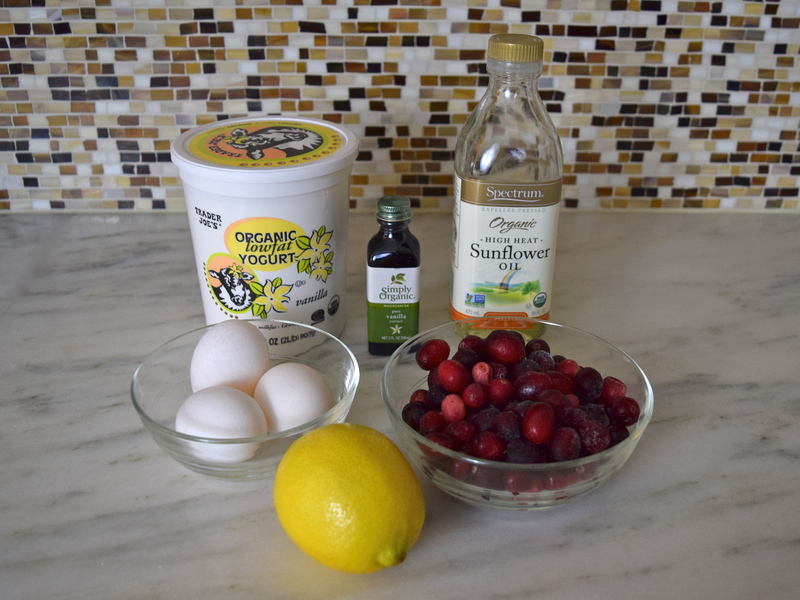 The one that keeps recurring every year is trying to eat healthier, so here is a delicious recipe for “Cranberry-Citrus Muffins” I found on health.com. 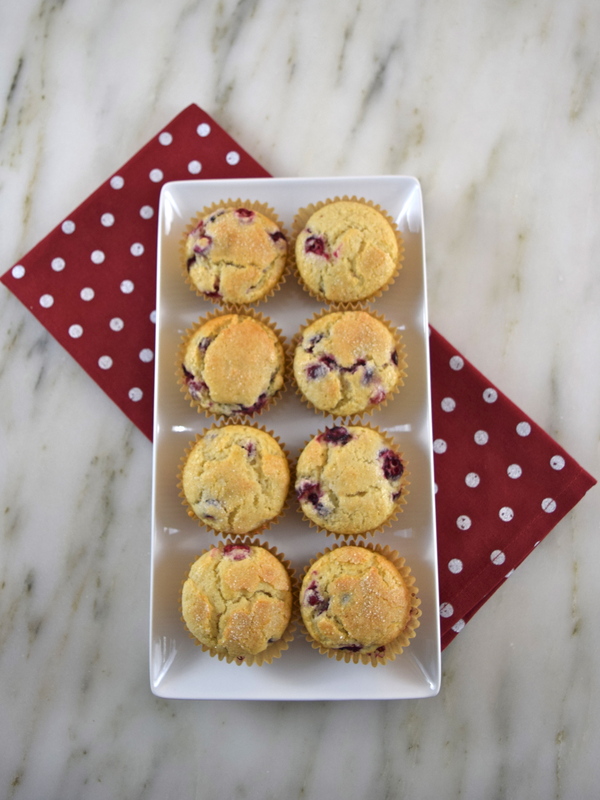 It has tart pieces of cranberry with a hint of lemon flavor from the lemon rind. They get their moistness from low-fat yogurt. I was able to use all organic ingredients, except for the baking powder! 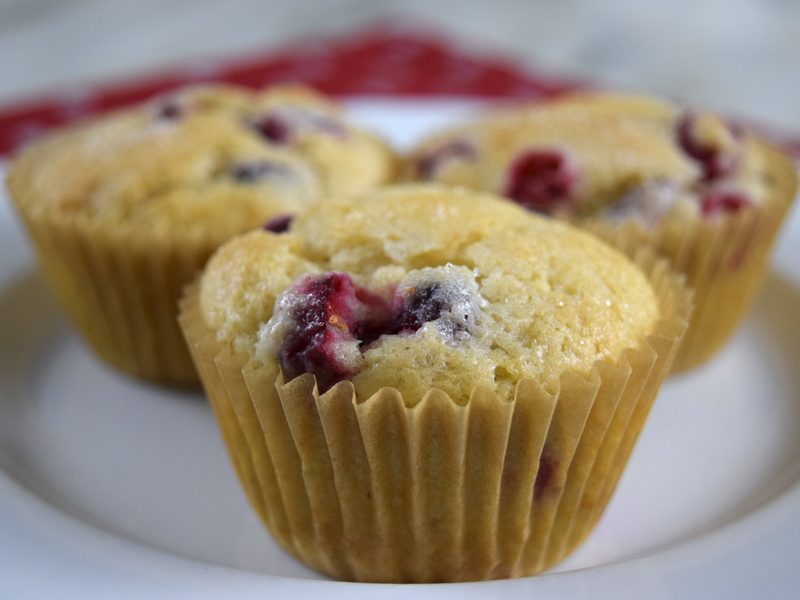 Using the 2 tablespoons of flour, sprinkle the cranberries and gently mix. Set aside. In a large bowl, mix 2 cups of flour, sugar, baking powder and salt. In a medium bowl, whisk together oil, lemon rind, vanilla extract, egg whites and egg. Create a well in the center of flour mixture, then add the oil mixture and stir just enough to moisten the flour mixture. Fold in the cranberries. Spoon the batter into 18 lined muffin cups. Bake for approximately 25 minutes, until lightly browned, and a toothpick comes out clean when poked in the center of a muffin. Place on a wire rack to cool. Makes 18 muffins. With my daughter coming home from college next week, I thought I would bake her some moist and light pumpkin muffins. 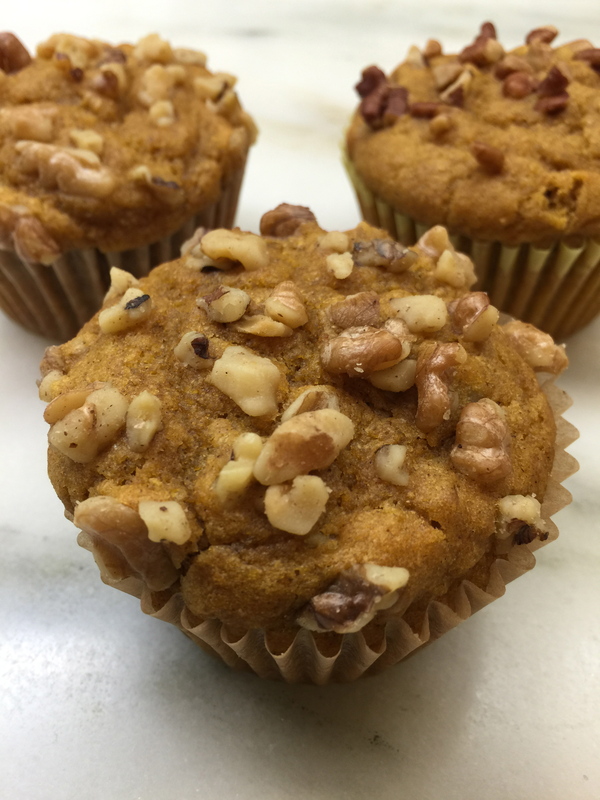 This recipe was adapted from Martha Stewart’s “Pumpkin Muffins.” I modified the recipe by using organic ingredients whenever possible, added some salt and some more pumpkin pie spice. 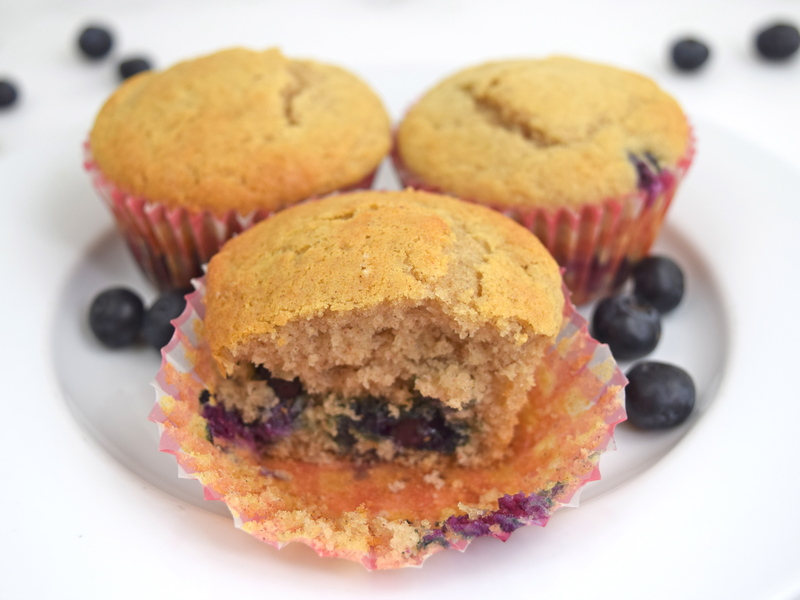 What I especially like about these muffins were that they contain healthy whole wheat flour, low-fat yogurt and walnuts! Preheat oven to 350 degrees. 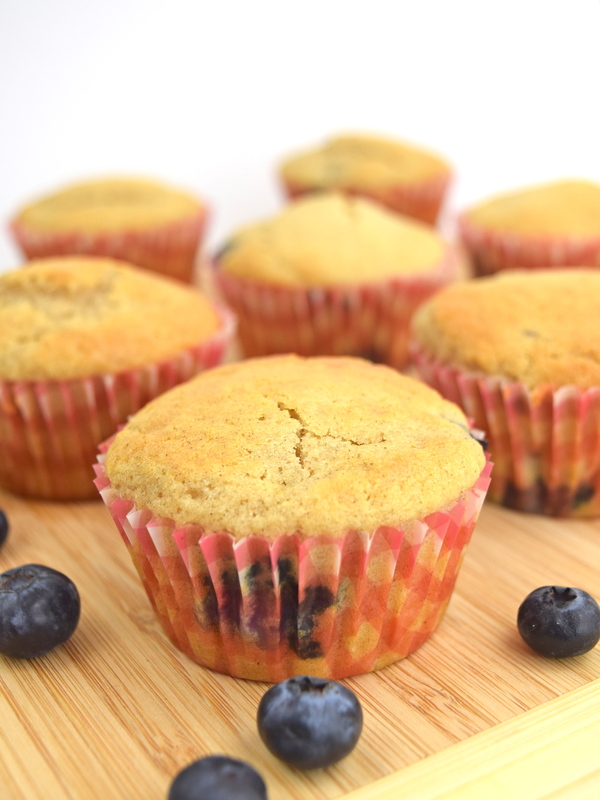 Place 24 baking cups into 2 regular size 12-cup muffin tins. Using a medium bowl, whisk flours, pumpkin pie spice, baking powder, baking soda, and salt. Using a large bowl, whisk oil, pumpkin, yogurt, eggs, and sugar thoroughly. Add dry ingredients and 1 cup walnuts. Mix until ingredients are moistened, being careful not to over mix the batter. Spoon batter into muffin tins. (Batter goes to approximately 3/8″ from the top edge of baking cup). Sprinkle the rest of the walnuts on top of the muffins. Bake for approximately 30 minutes. To test for doneness, insert toothpick in the center of muffin. If it comes out clean, it is done. Cool muffins in pans for 5 minutes. Makes 24 regular size muffins.